The public is being invited to a ‘give back to the community’ event, featuring some of Bermuda’s legendary jazz musicians, including Max Maybury, Shine Hayward, Toni Bari Trio, Somerset Brigade Band, and more, along with saxophonist Godwin Louis. The event will take place on Saturday, October 15 outdoors at the Sandy’s Middle School Amphitheater, with showtime at 7.00pm. Tickets are available online at ptix.bm and at Somerset Pharmacy, Music Box, and Roses Flower Shop. Part proceeds will be in aid of the Bermuda Society for the Blind and Open Airways. 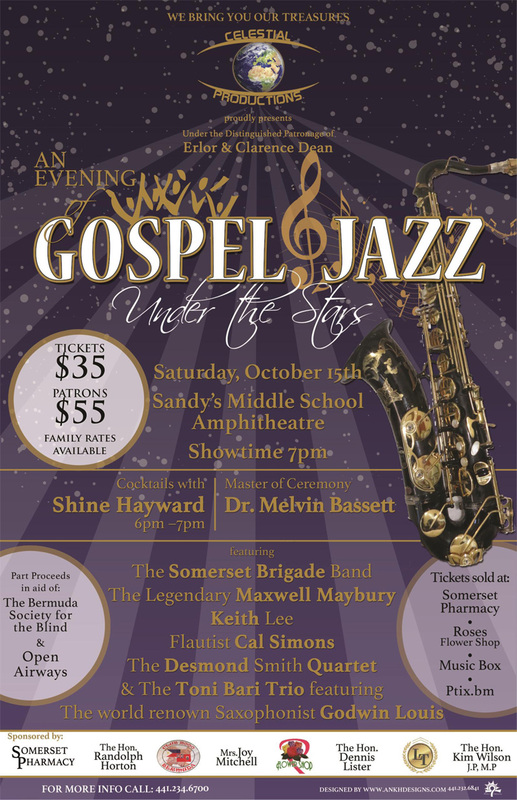 A spokesperson said, “Desmond ‘Des’ Smith – producer and promoter of ‘An Evening of Gospel & Jazz – Under the Stars’ – began his musical journey and dream, at the young age of 10, when he first heard the ‘jazzy’ sounds of the local legendary musician, Maxwell Maybury. “Des enjoyed the band and the performance so thoroughly that it created in him the desire to become a musician. “With this goal in mind, Des began making music in any way he could. He was very much interested in the wind instruments, and would make flutes out of sticks or anything round that he could find. He began recorder lessons in school, and at age 13, he received his first flute lesson from Max Maybury. 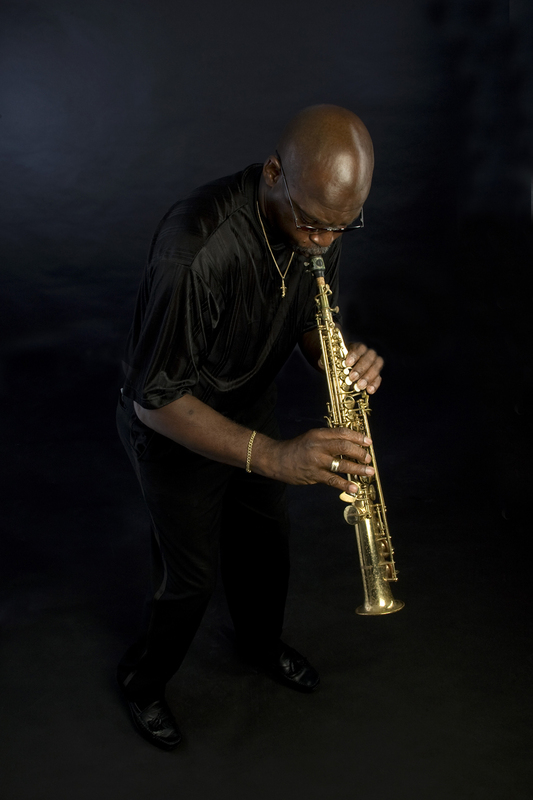 “While at a friend’s house visiting one day, Des picked up the friend’s saxophone and began experimenting. It was an old worn-out saxophone, but Des so enjoyed the feel and the sound. He soon joined the Somerset Brigade Band and began taking saxophone lessons, again from Max Maybury. “At age 16, Mrs. Emily Brangman, a mother figure to Des and all the youth in the neighborhood, helped Des get started in two important areas of his life: employment and passion. Firstly, she helped him secure a job at Cambridge Beaches, working as a bus boy, houseman and kitchen porter. 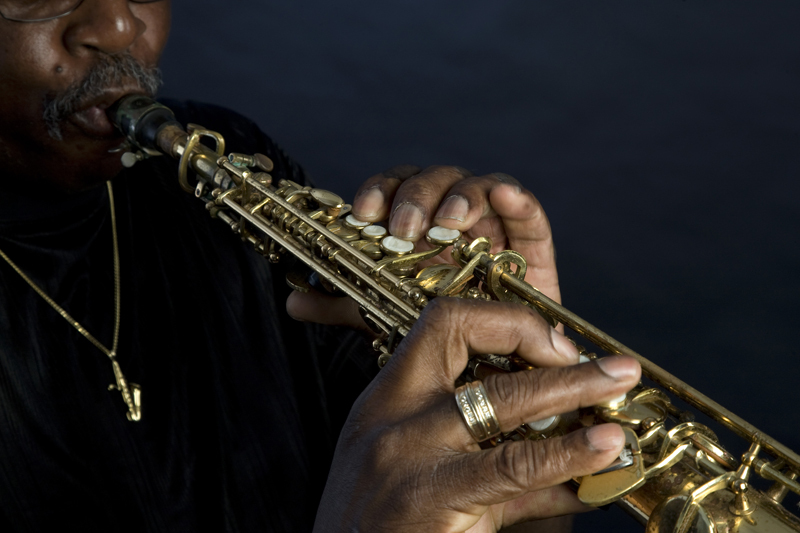 “Secondly, Mrs. Brangman put herself on the line for a loan of $984 so that Des could purchase his very own saxophone, a Selma Mark 6 Tenor Saxophone manufactured in France, a very sophisticated performance saxophone for someone so young. “Des no longer attended school, but worked long hard hours to earn enough to pay off the loan. When time permitted, Des, along with other friends performed music together at various weddings and house parties. They called themselves the “Desshespies”, a name uniquely created from their names. “Just as the trend toward discotheque music began, and ‘live’ music was fading out, Des was called into the Regiment where he served for three years. It was a busy time, working two jobs and playing with the Somerset Brigade Band. “Des would fit in solo practice time whenever and wherever he could, sometimes in the early mornings on the railway trail, or sometimes at Fort Scaur as the sun began to set. Des particularly enjoyed practicing outdoors in a natural setting. “To this day, people meet him on the streets and comment how they frequently used to hear and see him outside at various locations practicing his saxophone. “As Des entered his mid-30’s, he traveled to Hackensack, New Jersey, where he studied and became a qualified repairmen of various instruments, primarily winds and brass. He owned and worked full-time in an instrument repair shop, located in Somerset Marketplace. “During this time, he also specialized in carpentry, providing detailed creations for some of the large building firms locally. “After 11 years of owning his own instrument repair shop and creating intricate pieces of carpentry for contractors, Des had an unfortunate work accident, which left him with extreme impaired vision in his right eye. This meant he could no longer perform this line of work. “It was about this time that Des joined with his long-time friend, Shine Hayward, in the running of the Bermuda National Jazz Ensemble. The mission of this group was to encourage and engage young musicians in Bermuda in jazz music. For over 10 years, Des & Shine trained and then travelled with many of Bermuda’s young talented musicians to Kentucky, New Jersey and Canada to perform and give workshops. “Today, the Somerset Brigade Band along Dr. Melvin Bassett and Des, are actively working to revive this group, to bring in the youth of today and help them learn and appreciate the value of music. “With music in his heart, Des continues today, performing 5 nights a week at Blu, while still working days at the Fairmont Southampton. He will soon travel to Nashville to complete his Gospel CD titled “Because He Lives”. “He is hoping to have the CD completed before Mother’s Day, as a tribute to all the moms and women in his life that have helped him on this journey, especially his wife Tina, of 15 years. This is a fine example of a Bermudian role model that needs to be used as an example to all Bermudians. I wish you every success with your CD and look forward to purchasing several copies.